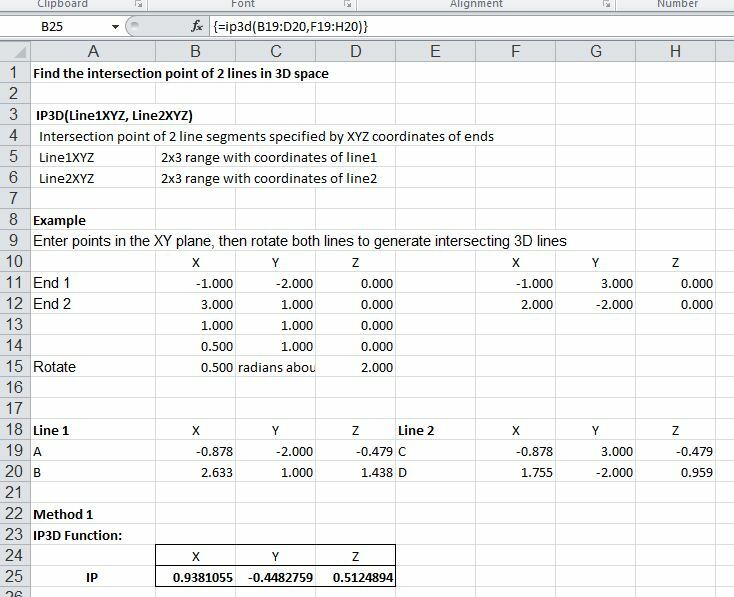 Following a discussion at the Eng-Tips Forum, I have written an Excel User Defined Function (UDF) to find the intersection point of two 3D line segments. The UDF has been added to the IP2 spreadsheet, which is available for free download (including full open source code) from IP2.ZIP. Check if either End of Line2 is coincident with either end of Line1. Check if either end of Line2 lies on Line1. 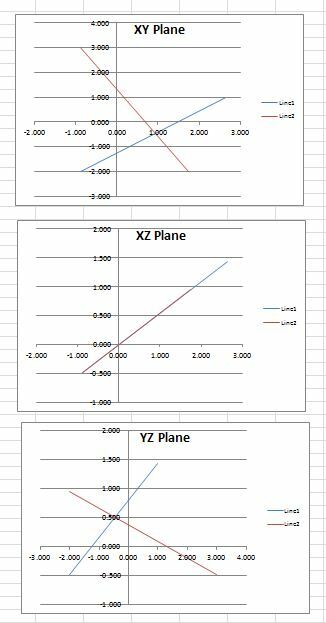 Check for quick 2D solution, if both lines lie on a plane parallel to the XY, XZ or YZ planes. Check that lines lie in the same plane, i.e distance of End2 of Line2 from the plane formed by Line1 and End1 of Line2 is zero. 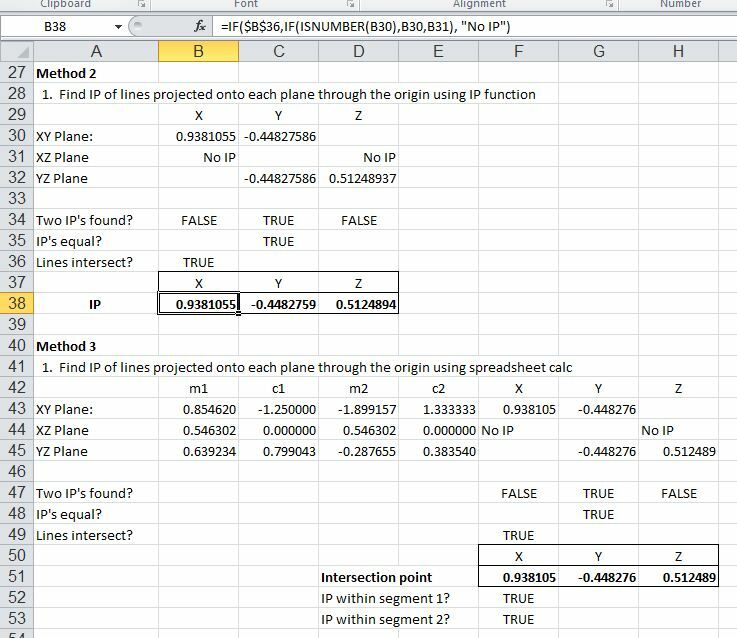 Find 2D IP of lines projected on to XY, XZ, and YZ planes. Check that the IP is within the length of each line segment. Extract the IP X,Y, and Z coordinates and assign to the function return value. This entry was posted in Coordinate Geometry, Excel, Maths, Newton, UDFs, VBA and tagged 3D lines, Excel, Intersection Points, UDF, VBA. Bookmark the permalink. Matrix operations can greatly simplify these type of calculations. It’s fun to try to extend to higher dimensions too, I’ve sent a hypercube example that might be of interest. PS. The vba code isn’t compiling for me in 64-bit office 2010 version, probably due to a 32-bit windows api call. Hi Lori – your post got sent to spam for some reason. Don’t know why, the filter is usually spot on. Where did you send the hypercube? I haven’t received anything. You might try deleteing the timer class from the VBA, I think that would be the only thing with any api calls. Method 2 — Z should be zero. Nitin – if the lines are in the XY plane the method won’t work, but you can just use a 2D intersection function in that case.